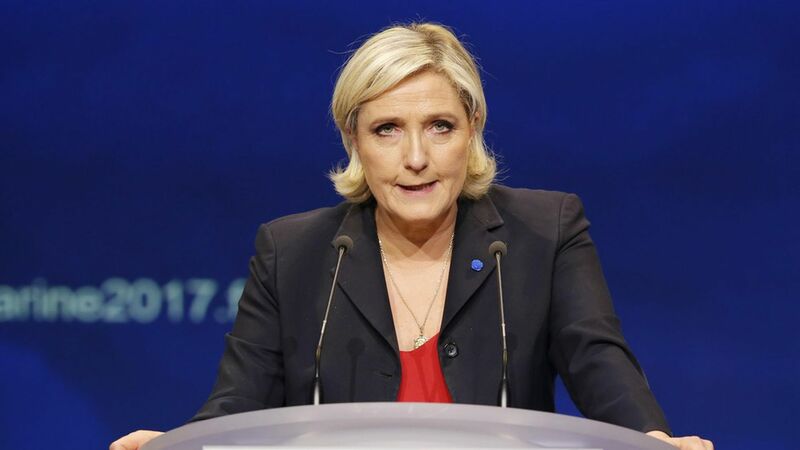 French presidential candidate Marine Le Pen could become the country's first female leader. But what's more interesting is that her campaign, if successful, could spark a right-wing, populist revolution. An unequal economy: Make sure that most gains are at the top. A disgruntled working class: No populism without the people. An "other": Be creative! Something to get the people going. Le Pen is taking a page out of Trump's playbook. Her Feb. 5 campaign announcement speech painted France as a weak nation threatened by multiculturalism and economic liberalism, all of which she says she can fix by restoring her view of civilization. "After decades of cowardice and laissez-faire, our choice is a choice of civilization," she said. "Will our children live in a country that is still French and democratic?" She wants to drop the euro, instead using a lower-value currency, "nouveau franc" that would make French exports more competitive. She wants to maintain Brexit. "The EU forbids us everything, punishes us, reprimands us -- and the end result is unemployment and poverty," she said during the first televised campaign debate. Her "France First" policies echo Trump's "America First" agenda. "The state must give priority to French companies and not foreign companies," she said. "I'm not here to create jobs for our neighbors." French companies that move to other countries would be subjected to an import tax, and she'd tax companies that hire immigrants. She has pledged to fight tax evasion and cut income taxes for the poorest workers. "I'm against the Right of money, and the Left of money. I'm the candidate of the people!" she said during a speech in Lyon. Her supporters, at least those who show up to her events, are usually factory workers and veterans, per NYT. She targets these people through her proposed tax cuts on low-income earners and through her events which are titled "In the Name of the People." Instead of promising to make France great again, Le Pen instead promises a return to order and sovereignty — something the working class can visualize through her plans to focus on increasing French jobs. A retired military officer who attended one of her speeches told NYT: "She's got a real program, in the name of the people, for the workers, and by the workers. It's for the nation, and not for the financial sector and the banks." Le Pen has identified "the other" as the elites, "Islamist fundamentalism," and even the European Union. Her speeches often speak to this idea of the people vs. the other by talking about jihadists carrying out attacks on French soil, crime-committing immigrants, or the EU elites stealing jobs from the French. It comes full circle: she paints the EU as the "other" by arguing that multiculturalism, which she finds threatening to France's sovereignty, is encouraged by the union.